Learn all you need to know about adapting to change, from initiating modifications to responding positively to them. 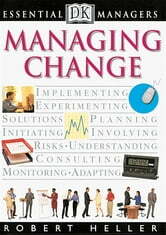 Managing Change enables you to understand and plan for change to achieve the best results, plus itprovides practical techniques for you to try in different settings. Power tipshelp you handle real-life situations and develop the first-class management skills that are the key to a productive and informed workplace. The Essential Manager have sold more than 1.9 million copies worldwide! Experienced and novice managers alike can benefit from these compact guides. The topics are relevant to every work environment, from large corporations to small businesses. Concise treatments of dozens of business techniques, skills, methods, and problems are presented with hundreds of photos, charts, and diagrams. It is the most exciting and accessible approach to business and self-improvement available. Ability to change is crucial in today''s business environment -- this book shows managers how to implement successful new ideas.